Over the course of 4 days 12 members conducted a Level 1 walkover landscape survey in the vicinity of Davy’s Lee Enclosure on Sewingshields Farm, by kind permission of landowner Mr P. Straker and farmers Messrs Murray. This report summarises what we consider to be the more significant findings. Prior to fieldwork members of the group studied existing Historic Environment Record (HER) data, National Mapping Programme data, Tim Gates’s aerial photographs and his 2004 report for Northumberland National Park Authority, plus Lidar images of the area. 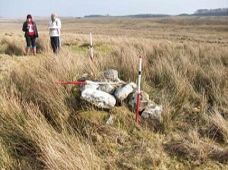 This enabled us to identify locations of potential archaeological interest. However, we applied a strict methodology of walking the entire study area, excluding the very worst of the boggy areas, in 20m bands to ensure that all ground features were examined.